Surprise: It doesn't even have a speaker in it. You know that old saying, “Dress for the job you want, not the job you have”? The same can be said of product branding. Maybe, if you think there’s even an infinitesimally small chance you might branch out of your core product focus in the future, don’t pick a name like “Sound Blaster” that really only applies to...well, audio components. 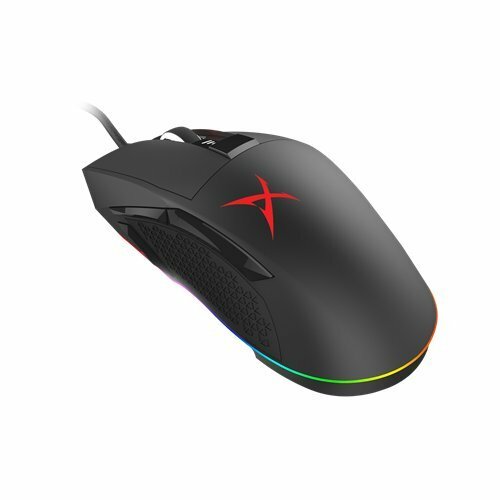 Which is to say: Creative makes a mouse now, and for some reason decided to call it the Sound BlasterX Siege M04. Yes, a Sound Blaster mouse. The other surprise? Aside from the name, it’s pretty damn good. In fact, considering that the Siege M04 (available for $80 on Amazon) is the first Sound Blaster mouse, it’s shockingly bold. 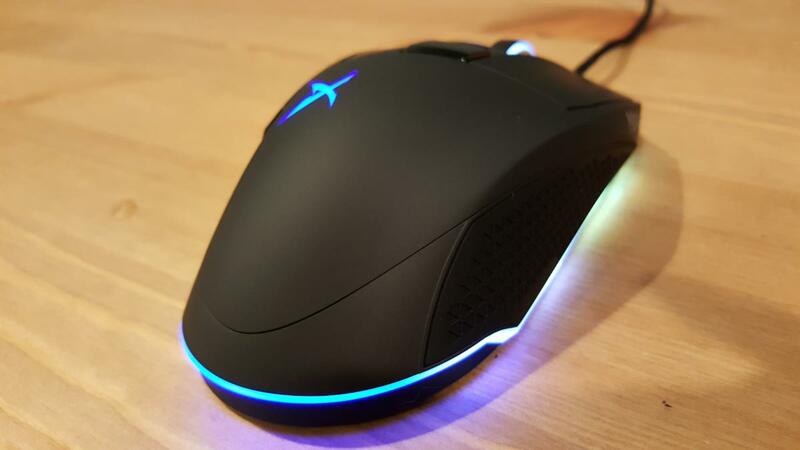 By comparison, the Pulsefire is HyperX’s first mouse and it’s more or less a clone of the evergreen Razer DeathAdder. First and foremost? The thumb buttons. I’m always on the lookout for a better thumb-button layout, or at least a more competent take on an existing design. The Siege M04 has the benefit of being both unique and simple. It takes a fairly standard three-button layout—two sitting above the thumb, one in front—and lengthens every button by about half an inch. It doesn’t sound like much, but it’s one of the few times I’ve been able to casually use all three buttons at once. The Logitech G502 I use day-to-day technically has the same layout, but the third button sits so far forward it’s hard to press both it and the rear button at the same time. The Siege M04 brings that one extra button within reach without having to move my thumb all over creation. Only if I palm grip, though. The Siege M04’s shape is still well within the parameters of the traditional right-hand scoop, but it has an elongated “pinched” shape that seems tailor-made for palm grippers, with a subtle indentation for the third and fourth fingers and a rubber grip that extends most of the way down the right side. I don’t think it’s “better” than other mice, per se—but it would be hard to recommend the Siege M04 to claw or fingertip grippers, or anyone with smaller hands. Within its bailiwick, however, it’s comfortable and eye-catching. 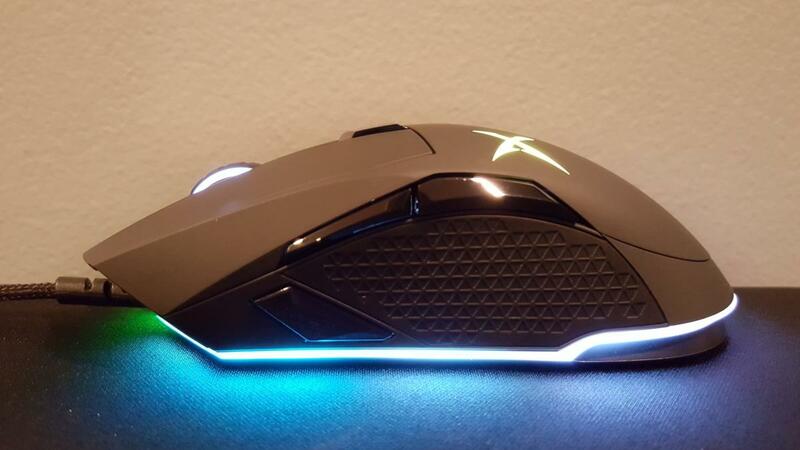 Creative has also doubled down on aesthetics by including an RGB LED light ribbon that makes a full circuit around the bottom of the mouse, similar to Razer’s Diamondback refresh, plus a lit-up mouse wheel and Sound Blaster logo on top. It’s gorgeous—provided you like flashy lights—and possibly the best RGB implementation I’ve seen on a mouse. It’s bright, the colors are vibrant, and it casts its light downwards onto your desktop, which is a neat touch. Enthusiasts will be happy to hear that the Siege M04 packs Pixart’s beloved PWM3360 sensor—essentially the same one in my G502 and many other gaming mice nowadays. The PWM3360’s popularity is in large part tied to its accuracy and excellent tracking. 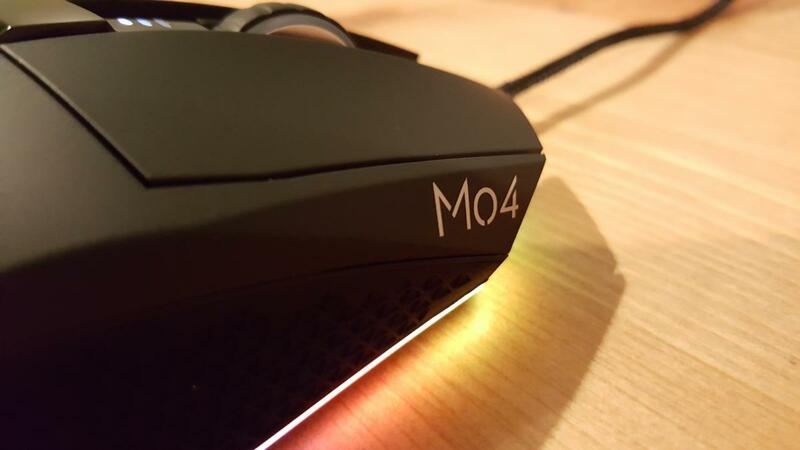 Like other PWM3360 mice, the Siege M04 is rated up to 12,000 DPI. There’s an on-the-fly DPI switch behind the mouse wheel, with default values set to 800, 1,600, and 3,200. The thumb button is pre-programmed as a “Sniper” button, which defaults to 200 and can be adjusted independently. Props to Creative on its software, too. Thanks to years of experience with audio peripherals, Creative already has a solid foundation for its peripheral software, known as Sound Blaster Connect, and it’s fairly polished. No “figuring this out on the fly” like other companies who’ve decided to enter the peripherals market late in the game. The biggest problem? Finding and downloading Sound Blaster Connect. The link is buried at the very bottom of the Siege M04’s product page, which takes you to another Creative support page that looks like it was made two decades ago, which prompts you to first install a firmware update before you download the Connect software. So I did, and was then baffled when I installed Connect and the first thing it wanted was for me to install another firmware update for the Siege M04. Okay. A bit awkward. But the software itself is great. I’d already used it a bit when reviewing the Sound BlasterX Katana earlier this year, and the Siege M04 implementation is strikingly similar—it even use dials for the DPI settings, as if you were adjusting audio effects. Unique, to say the least, but it’s easy to understand and all of the lighting effects are quick to implement. It’s also simple to re-assign or record macros to any button, if you’re interested. SoundBlaster name aside, I think the Siege M04 is a surprisingly competent mouse for Creative’s first attempt. It’s pretty basic, nothing too amazing, but lots to appreciate: The lighting is literally top-of-the-line as far as mice we’ve reviewed at PCWorld; the PWM3360 sensor is always welcome in my home; it’s got fairly large and smooth skates on the bottom; it’s lightweight; the cable is sheathed in fabric; and the shape is comfortable (at least for palm grippers). There’s not much to complain about, really. 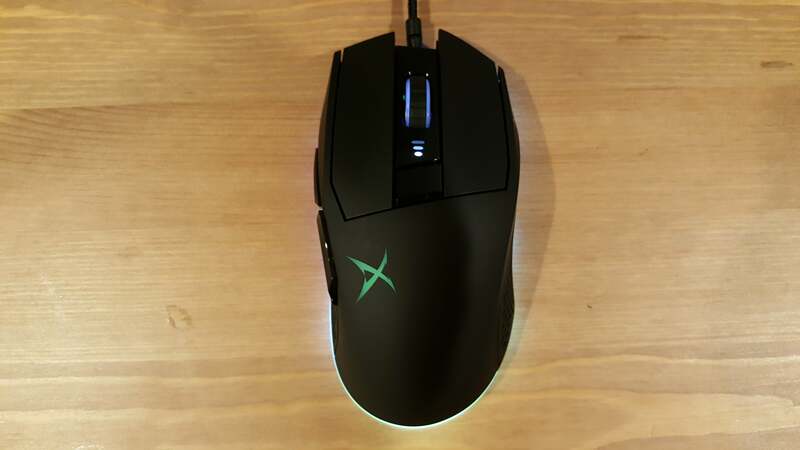 I’d like to see Creative put out an ambidextrous mouse next, or maybe one that’s sized a bit smaller for the claw and fingertip grippers among us, but I came into this review expecting to make jokes about audio companies delving into mouse design and instead came away thoroughly impressed. And Creative did it without taking the safe route, a la HyperX, by mimicking a tried-and-true design. Doubly impressive. Creative's debut mouse is a delight, featuring a PWM3360 sensor, beautiful lighting, and an interesting shape. Just leave the "Sound Blaster" name behind next time. A mouse with the Sound Blaster name?